"Earthworm Jim 2 is a platform video game originally developed by Shiny Entertainment and released in 1995 in Europe, and 1996 in the US. It is a sequel to the original Earthworm Jim. The music was composed by game music veteran Tommy Tallarico. 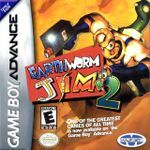 Earthworm Jim 2 follows the exploits of annelid superhero Jim and his new sidekick Snott as they try to rescue Jim's beloved Princess What's-Her-Name from a forced marriage to the nefarious Psy-Crow. While chasing them across the universe, Jim comes across the summer homes of a number of villains from the first game, including Evil the Cat and Bob the Killer Goldfish. The game originally appeared on the Mega Drive/Genesis, Super NES and the PC operating system MS-DOS, with enhanced versions later released on the PlayStation and Sega Saturn. It was also ported to the Game Boy Advance in 2002 and the Wii Virtual Console in 2009. Like the original game, Earthworm Jim 2 contains a lot of irreverent, surrealist humor. It also features more diverse gameplay than the original, with each stage having a different style and mission, as well as various new weapons. Gameplay is much more diverse than in the first Earthworm Jim, largely departing from the template of a standard platformer. Although the majority of levels are based on platformer elements, they also incorporate gameplay from a variety of different genres, including mazes, trivia contests, arcade game style levels, and a marathon race which acts as the game's final level in lieu of a boss battle. Many levels are heavily non-linear and are navigated in an unusual manner. For instance in the third level 'The Villi People/Jim's Now A Blind Cave Salamander! ', the player must guide Jim, defenceless in the guise of a blind cave salamander, through intestinal passages while avoiding exploding sheep and hazards embedded in the floor and walls. In another, the player controls Jim as he floats upward through a warped circus setting by means of his inflated head, avoiding touching sharp objects and light bulbs which will cause him to fall to the start of the level. Jim's movement has changed from the original Earthworm Jim. For instance, he can no longer use his head to swing or to hover like a helicopter. Instead, Jim is accompanied by a living mucus named Snott, who resides in Jim's backpack and allows him to float by morphing into a parachute and swing by sticking on ceilings that are covered with dripping goo." Source: Wikipedia, "Earthworm_Jim_2," available under the CC-BY-SA License.